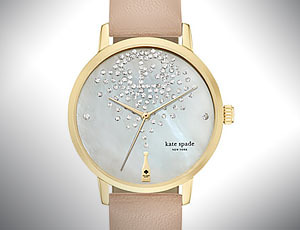 How to spot fake Kate Spade watches | iSpotFake. Do you? Kate Spade watches have become a symbol of style. Many people are in the business of selling replicas, however, and if you're a quality watch lover it's important to be able to tell real from fake. When buying a watch from an unfamiliar store or person, pay attention to the steps listed below, as well as tips and warnings. Our mantra. Don't buy Kate Spade watches on chinese electronic malls. They may have valuable offers for some electronics or appliances, but really can not sell genuine Kate Spade. Never. Lots of branded items on eBay or any other auctions are fakes. Even from trusted sellers, expecially from asian region. Check the price. If you know that genuine Kate Spade watches you looked for sells for $100-300, for example, and you see an offer for this same item with a buy it now price of $20-50, there’s a chance that watches may be a counterfeit. If it seems unrealistic, proceed with caution.